was accepted into the Societe Nationale des Beaux-Arts and his juried image,"Clarisse,"
"Sadie and Sally," a 2' x 2' watercolor on canvas, was accepted and hung in the Carrousel. 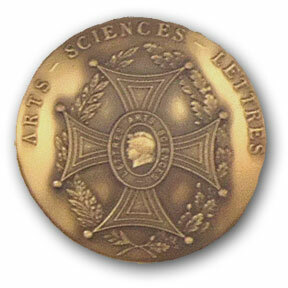 In February of 2013, Barnes was asked to submit a "body of works" for jury in the Academy of Arts, Sciences, and Letters in Paris. He was awarded the Bronze Medal for Painting. "My Three Graces," a 30" x 30" watercolor on canvas will hang in the Carrousel du Louvre, December 15-18, 2013. Mlle. Benedicte Lecat represents these works through galleries in Brussels, Barcelona, Cannes, Montreal and Toronto. Today, however, Barnes remains a regular sort of guy, painting just for the fun of it!